This is the text of the talks I gave at the University of California–Riverside and UC–Irvine, January 25 and 26, 2012. Graphs were added for the bloggy version. It’s funny. I spend most of my life writing about economics, politics, and finance, yet about the only academics who ever invite me to speak are in the humanities. Maybe that’s because I dropped out of a graduate English program and can’t do a proper vector autoregression. But you guys are more fun than a bunch of dismal scientists anyway. I took my title, “Reflections on the Current Disorder,” from William F. Buckley, who used it as an all-purpose label for his public talks back in the 1970s. Though it might seem odd for me, a non-conservative, to borrow a title from a paragon of American conservatism—one whose memory is fading, for sure, in these days of Fox News and Newt Gingrich—I was once a fan. In fact, I was once a conservative, for a year or two in the early 1970s. I was even a member of a strange formation called the Party of the Right in my early college days, a group that opens its meetings by reciting Charles I’s execution speech, which contains the striking revelation that government is no business of the people, because “a subject and a sovereign are clean different things.” (See here and here for more.) You may think that the U.S. fought a revolution against monarchy, but nostalgias for hereditary power still exist on the American right. Feel free to bring that up next time a Republican tells you that leftists are unpatriotic elitists. Anyway, Chairman Bill and I have different feelings about the idea of disorder, I suspect. (Though my friend Corey Robin argues in his new book, The Conservative Mind, that rightists are often revolutionary nihilists under their placid exteriors.) But the present state of the U.S. economy is a wreck. For most people these day it’s a source of misery at worst or profound uncertainty at best. I suppose there are more than a few right-wingers who have no fundamental problem with this. You never have to wait very long for some apologist to cite Joseph Schumpeter’s famous phrase “creative destruction,” a phrase that gets 1.3 million hits on Google. Also, according to Google, use of that phrase really started to take off with the onset of the neoliberal era in the early 1980s, peaking into the dot.com bubble and its immediate aftermath around 2002, and then falling slightly into 2008 (when their ngram database ends). A major problem with the phrase, aside from its unconcern (or at least its users’ unconcern) with the human distress associated with it—not to mention its indifference to Schumpeter’s original use, a Marx-inspired view of capitalism’s eventual demise—is that not much creation has been going on lately. I’m not talking about works of art, but conventional economic innovation—which may be going on in China, but sure isn’t going on here in the USA in any quantity. Throughout our history, this has been a brutal society, but at least it had a certain dynamism in both commerce and in culture. I don’t see much of that today. The last gasp of economic dynamism was that dot.com boom, which was often thoroughly delusional, but did have some energy to it, and did leave us some byproducts, like many miles of fiber optic cable. It also paradoxically presumed to address some concerns historically associated with the left—a flattening of hierarchies, the provision of meaningful work, the erasure of borders, and even peace, love, and understanding. Of course it did all that firmly within a capitalist paradigm, but it did have an embryonic aspect about it, if only in fantasy. No longer. Our most recent bubble built a lot of subdivisions in exurban Las Vegas, with no payoff either in the productive or phantasmic realms. There might be some payoff were the homeless and underhoused allowed to move into the empty dwellings, but that’s not the way the USA works—though the Occupy movement seems to be nudging things in that direction. So where are we, political economy-wise. Here are our coordinates in vulgar business-cycle terms. The Great Recession officially ended more than two and a half years ago, and to most people it doesn’t feel like much of a recovery. It was an awful recession. GDP, your orthodox economist’s favorite measure, contracted by over 4%, more than twice post-World War II recession average. The downturn officially lasted six quarters, a year and a half, two quarters longer than the average. Employment, the measure that matters most to regular people, fell by over 5%, almost twice the post-World War II average—and then fell by another 1% after the recession ended. The reason that it doesn’t feel to many people like the recession never ended is that it’s been the weakest recovery since modern GDP numbers begin in 1929 and modern labor market numbers in 1939. As of the most recent quarter, the third of 2011, GDP, that most fetishized of all indicators, has only regained its pre-recession high; based on historical averages, it “should” be about 10% above. Total wage and salary income is about 2% below its pre-recession high; normally, it’d be up 13%. Ah, but profits! Corporate profits are up over 80% from their recession low; normally they’d be up about 50%. Profits are up nearly ten times as much as wages—the average in a recovery would be less than three times. Corporations are flush with cash—they’re spending some of it abroad and distributing some of it to their shareholders and executives. What they’re not doing is investing or hiring here. The labor market, which is what most people depend on for their material welfare (about 80% of the population couldn’t live more than a few months without a paycheck at best), is a mess. We lost nearly 9 million jobs in the recession (actually we continued to lose jobs after the recession ended, well over a million of them) and have regained well under a third of them. 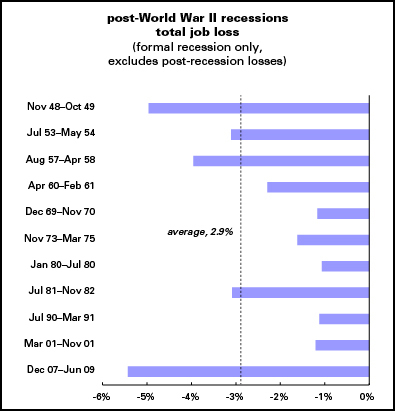 In a normal post-World War II recovery, we would have regained those job losses in less than a year and would now be well ahead of the pre-recession high. If this were that elusive normal recovery, nearly 7 million more people would be employed now than are. Yes, the unemployment rate has come down—in part because of the modest recovery we’ve experienced, but also because enormous numbers of people have dropped out of the labor force. If you’re not actively looking for work, you’re not counted as unemployed; if you haven’t looked for a job in the last year, you’re not even counted as “discouraged,” the official label for that brand of labor-market detachment. The share of the adult population working for pay, the so-called employment/population ratio, is exactly where it was when employment bottomed out in February 2010. It’s below where it was when the recession ended. It’s well below its all-time peak in 2000–2001. 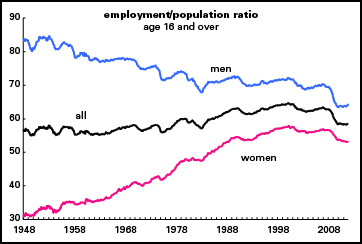 Over the long haul, the employment/pop ratio had risen steadily into that millennial peak, mainly because of the entry of women into the paid labor force. The male ratio had already been in a mild but steady decline since the end of World War II but its fall was more than offset by the rise in the female ratio. The ratios for both sexes plunged during the recession, men’s worse than women’s, and have basically just stabilized over the last couple of years. Men have actually done a little better than women—the result, I suspect, of a surprisingly decent recovery in manufacturing employment (dispoportionately good for men) and the shrinkage in government employment (bad for women). The overall employment/population ratio is back where it was in 1983, meaning that the entire employment expansion of the 1980s and 1990s has been reversed. At recent rates of job creation, it would take about five years to recover the jobs we lost, and that’s not allowing for population growth. If the population continues to grow at recent rates, it would take well over eight years. Sad to say, none of this is really a surprise. the economy and job market are following the script of a post-financial-crisis recession almost perfectly: they take years to recover from. But, as they say on TV, that’s not all. The 2002–2007 expansion was the weakest one in modern history. Jobs were created at a rate that was about a third the average of the post-World War II expansion. 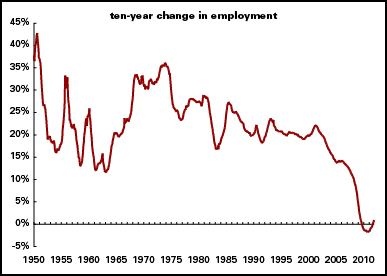 The combination of that tepid expansion, which was preceded by a long period of job market weakness, and the Great Recession, meant that employment from late 2009 through late 2011 was actually lower than it was ten years ealier—2% lower at its worst Since the 1930s, there had never been a period in which employment in the U.S. contracted over the course of a decade. The worst previous ten-year reading since the 1930s was a gain of 22% over ten years. We’re now recovered to where we’re not quite 1% above where we were ten years ago. That contrast is really striking: 22% previous worst, vs. an actual decline of about 3%.Back in the 1990s, cheerleaders used to love to talk about the Great American Job Machine. That machine has clearly popped a few gaskets. So how’d we get into this mess? We all know the story of the proximate causes of the economic crisis—a housing bubble enabled by not merely massive applications of credit, but credit packaged in unimaginably complex and obscure forms and a dispersion of responsibility that comes with securitization. There was a synergy of troublemaking here. Mortgage debt, after rising gently through the 1980s and 1990s, exploded after 2000. We know that lending standards deteriorated, to where the only requirement for getting a loan was having a pulse—and I bet you could even find some exceptions to that rule. (Some of that credit laxity may be coming back—my kid got a credit card solicitation a couple of months ago, well before his sixth birthday.) Downpayments became optional. The habit of packaging mortgages into bonds and selling them to distant investors removed any incentive for the original lender to scrutinize the creditworthiness of borrowers—and allowed trouble to proliferate around the world when things went bad. My use of the word “bond” in the last sentence is as quaint as downpayment became, because the finest minds of Wall Street assembled all manner of mortgages into complex derivatives that no one, even some of the people who sold them, could understand. (Ok, “no one” is an exaggeration. I think the actual count of people who undersood these derivatives was in the hundreds.) Investors had absolutely no idea what horrors were hidden in the structured products they bought, even though many came with a Aaa ratiing. Either the rating agencies didn’t know what they were grading or didn’t care—the issuers of the dodgy securities were the one who were paying their fees; as one rater put it in a famous email, they’d rate things put together by cows. Of course they weren’t put together by cows—the were put together by investment bankers, who are far more dangerous. The “problem” of the 1970s was, of course, stagflation—stag as in stagnation, and flation as in inflation. The stag part is actually rather misleading; the expansion of the Carter expansion saw job growth four times as rapid as that of the George W. Bush expansion, and GDP growth half again as high. For the whole decade, GDP growth in the 1970s was also half again as high as so far in the 2000s—but such a comparison for employment is near impossible, since job growth in this decade is close to 0. Note that job growth was far stronger relative to GDP growth in the Carter years than the W years. That gives a hint of the contrasting class dynamics of the two eras: labor got a much bigger share of the action in the much-criticized 1970s than it has lately, which is a clue to why it’s so fashionable to make fun of the decade, aside from its strange fashions. Inflation wasn’t just about rising prices—it was also about sagging productivity, falling profitability, limp financial markets, and, less quantifiably, a general loss of discipline in the workplace and the erosion of American power in the world. 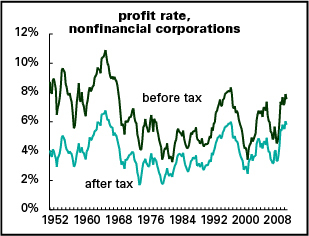 Corporate profitability, which had peaked at 11% in 1966, fell by two-thirds to under 4% in 1980. With high inflation, holding bonds became a losing proposition; Treasury bonds were nicknamed certificates of confiscation. Stocks turned in one of their worst decades ever—not as bad as the 1930s, but close. Obviously something had to give, and what gave was the working class, domeestically and internationally. Paul Volcker came into office in October 1979 declaring that the American standard of living had to decline, and he made it happen by driving up interest rates towards 20% and creating the deepest recession since the 1930s. (We just beat that record, but it took 30 years!) To the one-sided class war, Reagan added the ammunition of firing the air traffic controllers—the very opposite of what a Republican president had done with strikers only a decade earlier—and it was open season on organized labor. Wages and social spending were squeezed, and the deregulatory agenda that began under Carter was intensified. Abroad, Latin America was thrown into debt crisis, a crisis that for a while threatened to take down the global banking system—but instead, the problem was solved through the now-familiar neoliberal agenda of privatization and opening up to cross-border trade and financial flows. Debtor countries were forced to dismantle their nationalist–protectionist development regimes as a condition of new finance, and to open to foreign trade and capital flows. The program was very successful. Internationally, Latin and other debtor countries were brought into the global flow of goods and money. Domestically, the recession scared the hell out of the working class; people were glad to have a job, and wouldn’t dream of telling anyone to shove it. Business became essentially free to do whatever the hell it wanted to. Profitability recovered strongly, rising throughout the 1980s and 1990s to a peak of over 8% in 1997—not quite 1966 levels, but still more than twice the trough of 15 years earlier. It took a while, but productivity finally joined in. In the military–political sphere, U.S. power was enhanced, and we kicked the Vietnam Syndrome too. Discipline problems were a thing of the past. But through those bubbles, busts, and recoveries, one constant persisted. A system dependent on high levels of mass consumption has a hard time living with a prolonged wage squeeze. I mean that not only in the economic sense, but also a political/cultural one. American life is very insecure and volatile, and the ability to buy lots of gadgets assuages that to a considerable degree. Mass consumption staves off what could be a serious legitimation cdrisis. For the last few decades, the economic and political contradiction has been managed, if not resolved (not that it could ever be) through the liberal use of debt—credit cards at first, and then mortgages from the mid-1990s onward. The explosion in household credit —from 65% of disposable income in 1983 to 135% at the 2007 peak (most of it from mortgages, by the way)—is what made the booms and bubbles of the last three decades possible. This is especially true of the 2001–2007 expansion, which featured the slowest employment and aggregate wage growth of any cycle since numbers the numbers begin in 1929. Without the massive cashing in on appreciating home equity—Americans withdrew several trillion dollars worth of home equity during the decade of boom, all of it borrowed against rising house values that would soon go into reverse, and spent much of it—consumption would have languished and the home improvement business would have gone under (since home improvements during the bubble were financed almost exclusively by equity withdrawals). And since we have almost no domestic savings, much of the cash for that adventure came from abroad, from places like the People’s Bank of China. In any case, in the paper, IMF economists Michael Kumhof and Romain Rancière wondered aloud whether the increase in inequality we’ve seen over the last few decades contributed anything to the causes of our economic crisis. They attempt to model, in rigorous mathematical fashion, the perception that poor and middle-income households borrowed aggressively to maintain or expand their standard of living while wages and employment were growing only weakly, at the same time that rich households had more money than they knew what to do with, so they sought profitable opportunities to lend all that spare cash to those below them on the income ladder. Kumhof and Rancière draw parallels between the recent period and the 1920s. In both periods, the share of income claimed by the top 5% rose dramatically, and by similar magnitudes. And during the 1920s and the recent period, roughly the last 25 years, the ratio of household debt to underlying incomes doubled. Sometimes conservatives defend income inequality in the U.S. by appeals to our instinctive but untested assumptions about mobility. That is, the alleged ability of people to raise their incomes over time, over that of their parent or their own young selves, is thought to compensate for the high levels of inequality at any one moment. But actually this excuse doesn’t hold water. The U.S. is no more mobile, and is often less so, than other rich countries; that is, people here are no more likely, and are often less likely, to surpass the income levels of their parents than they are in Western Europe. And the U.S. today is, if anything, less mobile than it was a few decades ago. 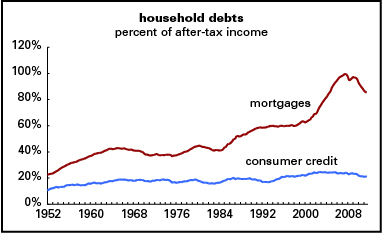 And over the last 25–30 years, nonrich households have increased their indebtedness far more than those at the top. Back in 1983, the richest 5% were significantly more indebted, measured relative to their incomes, than the bottom 95%. That position has since reversed. So almost all of the increase in U.S. debt ratios—a household debt level of not quite 70% in 1983 compared with 135% at the peak in 2007, a near-doubling—has come from the nonrich portion of the population. At the same time, the financial sector has grown enormously (more on this in a moment). A major reason for this growth has been its arrangement of all that borrowing and lending between the capital-owning class (the top 5%) and the bottom 95%, the workers. By the way, despite the Marxish cast of these labels, they come from the IMF economists, not me. We don’t have the same sort of detailed statistics covering the 1920s, but the broad outline is very similar: polarization offset by increased borrowing, followed by a major financial crisis. In their analysis, Kumhof and Rancière, following the argument of the IMF’s former top economist, Rajuran Rajan, “that growing income inequality [and I’m quoting them, not me] created political pressure—not to reverse that inequality, but instead to encourage easy credit to keep demand and job creation robust despite stagnating incomes.” So what is to be done in the face of this? Kumhof and Rancière, quite plausibly, say there are only two ways of dealing with our present pickle. On the one hand, we can have an orderly debt reduction—a policy of slow and careful writeoffs and debt forgiveness rather than massive default leading to financial crisis. Well, we’ve already had some of that, and we’ve made more than a dent household debt levels, but the result has been a rather glum economy. A second possiblity is, of course, as Kumhof and Rancière put it, “a restoration of workers’ earnings—for example, by strengthening collective bargaining rights.” That is, raise wages and strengthen union power. In the recent political environment, that looks like a tall order, but maybe things are changing. Kumhof and Rancière acknowledge the political obstacles to the wage-raising strategy. But, as they put it in that gentle and sober way that mainstream types are fond of, “the difficulties of doing so must be weighed against the potentially disastrous consequences of further deep financial and real crises if current trends continue. Restoring equality by redistributing income from the rich to the poor would not only please the Robin Hoods of the world, but could also help save the global economy from another major crisis.” I should point out that this paper was a product of an IMF run by the French quasi-socialist, Dominique Strauss-Kahn, who ran into a bit of trouble in a New York hotel. I quoted that IMF paper as noting the enormous increase in the size of the financial sector. I’d like to say a few words about that. I’d thought that the financial crisis that began in 2007 and got truly awful in 2008 would put an end to the long rise of the financial sector in the U.S. economy. Maybe not lead to a major political transformation, but at least some downward adjustment to Wall Street’s enormous economic and political power. Didn’t happen, did it? If anything, Wall Street has used the crisis if not to enhance its power at least to demonstrate it. There are several dimensions to Wall Street’s rise to pre-eminence over the last few decades. One can simply be measured in money. For example, in almost every year since the U.S. national income accounts begin in 1929, securities and commodities brokers have been the highest-paid of almost the almost 90 industries reported by the Bureau of Economic Analysis. And the securities industry’s premium has grown enormously over time. From 1929 through 1939, it was 237% of average pay. It fell during World War II and the immediate postwar decades, at just under 180% of average pay. But with the takeoff of the bull market in 1982, the premium began to swell, crossing 300% in 1992 and 400% in 2006. It fell back some in 2008, to a mere 409%. It fell back some more in 2009 to 366%, which, though below the massive heights of a few years ago, is still higher than anything before 2004. Or take profits. As the bull market was about to take off in 1982, the financial sector claimed 12% of pretax profits in 1982; that nearly tripled to 34% at the 2008 peak. It fell by more than half in the heat of the crisis, to 15% at the end of 2008—but it back to nearly 30%. That’s a remarkable share for a sector that employs less than 6% of the workforce. Or take the proliferation of assets. 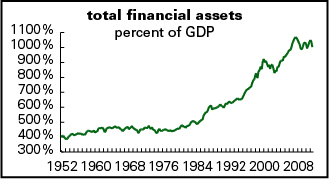 Financial assets of all kinds—not just debt, but equities and everything else the Federal Reserve counts in its flow of funds accounts—were equal to 462% of GDP in 1982. That measure rose steadily for the next 25 years, more than doubling to a peak of 1,058% of GDP in 2007. The ratio came down a bit with the early stages of the financial crisis, but bottomed in the first quarter of 2009 and has been more or less flat ever since. So here’s the story the numbers tell us: after a long period, mainly the Golden Age of the post-World War II decades through the 1970s, Wall Street was something of a torpid backwater. Its denizens lived well, but not large. But since then, they’ve accumulated an enormous amount of wealth. Then there’s the issue of power. The financial sector has surprisingly little to do with raising money to finance real corporate investment. It rarely has. That’s especially true of the stock market. Even in the boomiest moments of the late 1990s dot.com bubble, IPOs—first offerings of stock to public investors—financed only a small fraction of corporate investment, about 5–6%. Or, looked at another way, if you combine net equity offerings—which, given the heavy schedule of buybacks over the last quarter century, have been negative most of the time since 1982—takeovers (which involve the distribution of corporate cash to shareholders of the target firm), and traditional dividends into a concept I call transfers to shareholders, you see that corporations have been shoveling cash into Wall Street’s pockets at a furious pace. Back in the 1950s and 1960s, nonfinancial corporations distributed about 20% of their profits to shareholders. In the 1970s, that fell to 15%, which helped create the sour mood on Wall Street in that decade. After 1982, though, the shareholders’ share rose steadily. It came close to 100% in 1998, fell back to a mere 25% in 2002, and then soared to 126% in 2007. That means that corporations were actually borrowing to fund these transfers. It fell during the crisis, bottoming at 21% in mid-2009, but as of late last year, it was almost 70%. Businesses do get outside financing, yes, but the most important source of that is old-style banks. So what exactly does Wall Street do? Let’s be generous and concede that it does provide some financing for investment. But an enormous apparatus of trading has grown up around it—not merely trading in certificates, but in control over entire corporations. I think it’s less fruitful to think of Wall Street as a financial intermediary than it is to think of it as an instrument for the establishment and exercise of class power. It’s the means by which an owning class forms itself, particularly the stock market. It allows the rich to own pieces of the productive assets of an entire economy. So, while at first glance, the tangential relation of Wall Street, especially the stock market, to financing real investment might make the sector seem ripe for tight regulation and heavy taxation, its centrality to the formation of ruling class power makes it a very difficult target. For a long while, shareholder ownership was more notional than active. After the 1929 crash, Wall Street sort of receded into the background, giving us the Golden Age of Galbraith’s managerial capitalism—when managers and technocrats ran corporations and shareholders were at most silent partners. But when economic performance faltered in the 1970s, when the Golden Age was replaced by Bronze Age of rising inflation and falling profits, Wall Street, meaning shareholders, finally asserted themselves. They unleashed what has been dubbed the shareholder revolution, demanding not only higher profits but a larger share of them. The first means by which they exercised this control was through the takeover and leveraged buyout movements of the 1980s. By loading up companies with debt, they forced managers to cut costs radically, and ship larger shares of the corporate surplus to outside investors rather than investing in the business or hiring workers. This cost-cutting mania helped drive the outsourcing movement. The 1980s debt mania came to a bad end, as highly leveraged companies found themselves unable to cope with the early 1990s recession. So the shareholder revolution recast itself as a movement of activist pension funds, led by the California Public Employees Retirement System (CalPERS). The funds lobbied management, drew up hit lists of badly run companies, and generally pushed the idea that firms should be run for their shareholders. It had some successes. Compensation structures were rejiggered to emphasize stock over direct salaries; the idea was to get managers to think and act like shareholders, since they were materially that under the new regime. But pension fund activism sort of petered out as the decade wore on. Managers still ran companies with the stock price in mind, but the limits to shareholder influence have come very clear since the financial crisis began. Managers have been paying themselves enormously while stock prices languished. If the stock price wasn’t cooperating, well, options could always be back-dated. The problem was especially acute in the financial sector: Bank of America, for example, bought Merrill Lynch because its former CEO, Ken Lewis, coveted the firm, and if the shareholders had any objections, he could just lie to them about how sick the brokerage firm was. It was as if the shareholder revolution hardly happened, at least in this sense. But all that money flowing from corporate treasuries into money managers’ pockets has quieted any discontent. Wall Street demonstrated its immense political power during the financial crisis and its aftermath. Financiers may bellyache about increased regulation over the last couple of years, but the actual changes have been very minor. The major bill that changed the regulatory architecture, nicknamed Dodd–Frank, was weak tea to start with and is being watered down further as the detailed regulations required in the legislation are written. So in return for hundreds of billions of dollars in public funds used to keep the financial system from going under, the banks will emerge from this crisis largely unscathed. One reason for this is Wall Street’s skill at lobbying, and its ability to spread huge amounts of cash around Washington. As Public Citizen documented, between 1998 and 2008, Wall Street spent $5 billion in campaign contributions and deployed 3,000 lobbyists across Capitol Hill to get its way. While $5 billion sounds like a lot, it was less than a third of the Goldman Sachs bonus pool for 2009, and spread out over a decade. Wall Street has a lot of money, and Congress can be bought on the cheap. But, as I argued earlier, Wall Street also represents the commanding heights of the economy, the central mechanism by which ruling class economic power is formed and exercised. It’s only surprising to people who don’t understand this that Washington dances so faithfully to the bankers’ tunes. In giving talks like this over the last few years, this is the point at which I’d moan about how in the midst of the worst sustained economic crisis in 80 years, the major political energy was coming from people with tea bags on their heads. It seemed that we needed—even in relatively mainstream terms—a serious rethink of the neoliberal economic model, and none was forthcoming. I would lament the lack of interest in doing anything serious about our economic situation, except embracing varying doses of austerity, which would only make things worse (see, for example, the periphery of Europe, which in this case includes Britain). I would worry about the inability even to admit, much less do anything, about the challenge of climate change. Then I’d move on to expressing a wish that I could detach myself from the consequences and find it all amusing, in the style of H.L. Mencken. But I couldn’t do that. Now that I’ve got a six-year-old who is growing up in this nuthouse, I’ve come to take it all more personally. All this has changed dramatically in the last few months. Thanks to a small band of people who moved into a private park near Wall Street last September 17, political discourse and activism have taken the most hopeful turn that I can remember. I have my reservations about the ideological orientation of a lot of the Occupiers. And it’s hard to know whether this spirit will survive the winter—or the banalizing tendencies of presidential election campaigns. But I’m going to bracket that for now and admit to more than a shred of hope that things are turning in a seriously better direction. Finally. Indeed, this was the biggest tragedy of this crisis period. One would have thought that the “wiser heads” would have made the modest corrections needed to restore a modest legitimation, but no. I would argue for the addiction model; after-tax profits are at or near all-time highs in the present dysfunctional economy (dysfunctional for all but the oligarchs, I mean). Thanks for this concise and cogent analysis. You’ve got some unintended grammatical errors e.g. staring a sentence with a small letter which flaw an otherwise excellent analysis. I shared it on my FB page. Heavens, have I dropped the ball on that Julio? Sorry! That is easy to mend, Doug. :-) We’ll be following up and hope to have you over in March or early April, if available. My reading of the graph immediately below the comment above shows a low of about +12% over ten years around 1963. Also, you say “decline of about 3%” but just a couple sentences before you mention the figure being “2% lower at its worst”. I’m a little confused. Am I missing something? Thanks for this nice piece, by the way. excellent historical review of the american system. it is a pity that there are americans who know what is wrong but due to the power of the criminals who rule the world from Wall Street such people are doomed to the margins. This sounds like an interesting talk. All the same the basic points you are making seem like common sense. It is frustrating that we still have to actually debate over these points. This is off topic but I read recently that the EU is freezing the assets of Iran’s central bank. Do you know how much damage this will do to Iran? This is a wonderful one-sentence summary of contemporary political economy. The next task is to find a way to help the masses of HuffPo/liberal/progressive types overcome the enormous psychological barriers that prevent them from comprehending ideas of this sort. Great piece but I wonder what your “reservations” are about the Occupy Movement. I know you’re criticial of “producerist” arguments but, I gotta tell you, this article is grist for the producerist mill. That’s fine by me. I try to stay focused on the big M-C-M picture but I often find the anti-producerist, anti-populism preoccupation annoying. To paraphrase Howard Beale, we have to get angry. Wow. This piece listed the situation in the most clear way that I could imagine. I’ve done some consulting work, mostly for telcom companies in the 90’s and 00’s. Mostly AT&T. I was struck that a company as large as AT&T was being beaten up by Wall Street. The managers were in fear of Wall Street. This is the key point: Wall Street was not a source of capital – it was a source of agitation or possibly an attack. If they could not ‘make their numbers’ Wall Street would find someone who could. And if that other guy was Worldcom, cooking its books, whatever. The ‘modern’ financial sector is a negative player in American Society. I hope they don’t kill the host.